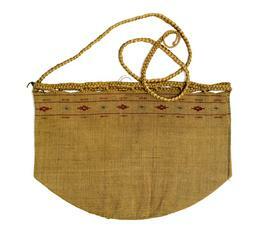 This large woven carrying bag has open mesh on its bottom, to allow for drainage. It was probably for harvesting sea urchins, mussels, sea weed, and other foods along the ocean shore. Mary Bourdukofsky: It’s a big one. It could be their traveling bag or for food. It’s a carryall bag. You can use it for anything it looks like. Nicely woven. Maria Turnpaugh: Hmm-mm. Look how the [weave at the] bottom opens up. It’s open weave. Mary Bourdukofsky: It stands up. Vlass Shabolin: Yes, it’ll sit flat on the bottom. It’s amazing how they made their things. Aron Crowell: Is it the same kind of weave, just adaptable to any sort of shape you want to make? Mary Bourdukofsky: It’s spaced, not tight like ours. Did you notice? Maria Turnpaugh: But it’s the same kind of weave. Daria Dirks: But look at the bottom, it’s different [open weave]. And then look at this side [edge at fold], it doesn’t have it [open weave] on this side, but it does right here [other side]. Mary Bourdukofsky: Yes, it does on this side [back of fold at edge]. Daria Dirks: I wonder why, maybe to drain something? Maria Turnpaugh: To drain something, probably like clams and stuff. Mary Bourdukofsky: The fish things are widely spaced. Mary Bourdukofsky: Look how they weave it. You catch this, go around again and catch that, then go around again. Maria Turnpaugh: Yes, they make loops and then you go over it. Daria Dirks: Did she just weave this [design]. I wonder how she made it so straight. Mary Bourdukofsky: It’s one line. Daria Dirks: Mine would be crooked. Maria Turnpaugh: You can make one like this. Daria Dirks: It’d take me a few years to make it this perfect. Maria Turnpaugh: You know, once you start, if you keep at, it it’s so much easier. And you get more uniform then stopping and starting again, if you work at it for longer times.